Welcome “Make it Happen” readers! If you’re visit me for the first time because of my guest post on Arvind Devalia’s blog, I’m glad to have you here. As it happens, this “7 Links” post I scheduled for today provides a unique introduction to this site. I hope you’ll sign up to get free emails announcing each of my new posts. The idea of this blog is simple: I’m getting so much more than I ever imagined from my simple, deliberate life, and I want you to have a life that’s beyond your wildest dreams, too. I think decluttering, minimizing and simplifying can help you get there. So I write about those things — and some other things, too. To all my readers: I don’t have a guest post scheduled yet for next Wednesday, July 28. Why not write something and see what happens? If I don’t get something by Tuesday, there won’t be a guest post next week, but I’d like to offer a guest post every Wednesday. For more information, see the Guest Posts tab at the top of every page. If you’re reading by email or RSS, come to the site to see it. Now, here’s a Friday bonus post. When blogging guru Darren Rouse posted the 7 Link Challenge on his ProBlogger website, I wasn’t impressed. Another challenge. Another list. Does anyone really care? This is a bit tricky because I started and stopped a few times before I actually got moving with this blog, and I deleted a few tests and useless posts while readying this site for a wider audience, but this post, from April 2009, is the oldest on this site. I didn’t really get started with the blog until December 2009, but this post somehow seems to belong here. It clearly shows a writer struggling to find something useful to do with his words. This post may, at first, seem wildly off topic, but it’s about simple, deliberate, meaningful life. I saw the little horse that afternoon, then I came right home and wrote the post. Simple and elegant, it’s a bit more of an essay than a post, and I’m proud of it. There weren’t many comments on this post, but I think I got a few people actually thinking. I don’t usually get very many comments on my posts, but I’m getting more all the time, and I also appreciate the comments I get by email and Facebook. Still, I’d like more comments, more diversity of opinions and more discussion between commenters, but I’m not being pushy or anything. This recent post on thesimplerlife.net makes a very important point about minimalism, and I could have written it myself. Really. I could have. I try to make my posts helpful as often as I can, but this post — originally intended to be completely tongue-in-cheek — turned out to contain some useful information for those who aren’t familiar with why blog comments matter. When you’re in the middle of a full decluttering of your life, some interesting and unusual thoughts come to mind. Is Forgiveness Far Enough for You? I wish more people understood that forgiveness is for beginners. When we really recognize who we are and where we come from, forgiveness is a rather silly idea. And by the way, comments are still open on all my posts, so as you go to each one — and I hope you will go to each of these — please leave some comments. You can be sure I’ll see then, and so will the others who join you on this journey around my blog (and Sam Spurlin’s). Sam, I’ll be watching to see if I get a mention on your blog. In fact, I’m always watching your blog. Thanks Gip! I particularly liked Minimalism is for Suckers–great find. Thanks Gip, I keep hearing of all these link challenges and I guess I will have to investigate further. I like you no nonsense style and love some of the posts such as minimalism is for sucker. I had similar thoughts but I was bit more polite. 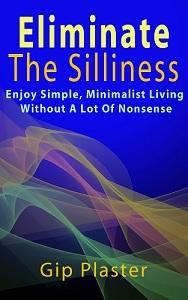 I am wary of all these 100 things minimalist and 50 things minimalist, there are many ways we can all be minimalist or maximalist in your term! I like your about page, how is book business, I love love reading so I will check it out. Gip, I’m very glad that you took the 7-link challenge in spite of your initial reservations. It was entertaining and informative to read your links. I was moved by your heartfelt post about The Little Horse. Your choice for post you wish you’d written was brilliant. And your own Decluttering the Human Body post was weird and wonderful. It is strange that an organ like the appendix–which does no good but can kill you at any time for no reason–persists through the millenia.